When you feel your book is ready to publish, it is actually time to call in a professional editor. Freelance editors will work on many levels – substantive editing, line editing and copy editing. Often, they will do a combination of the three. So what’s the difference and what does your manuscript need? Copy editing or proofreading is the most basic editing. It checks typos, spelling, grammar, syntax and facts. Many editors include this with a higher level of editing. 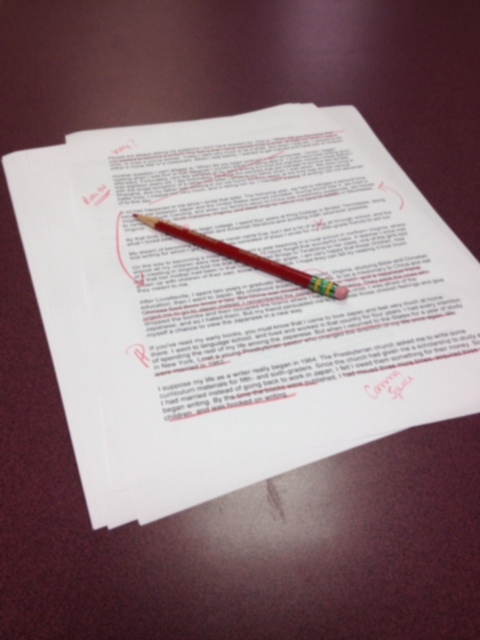 This is often the very last pass editing that is done before publication. Substantive editing goes deeper. It is the big picture edit. The editor helps you tighten the writing by making the characters believable. He will also help you make the plot make sense and make sure the setting is consistent. This form of editing is most concerned with structure and content. When I found my editor, we discussed what I felt I needed, and I sent her a sample of my manuscript. We landed somewhere around the line editing with substantive editing as needed. When I first sent my novel to her, I was so nervous. So few people had read my work, and certainly not a professional! Thank God, Candace was just that – a professional. She addressed all my concerns and was gentle in her criticisms and feedback. The process took about three months with three editing passes by my editor and three rewrites by me. It gave me a whole new perspective on the mechanics of our language and brought me flashbacks of Mrs. Boyuka’s 9th grade English class. I loved grammar but haven’t really thought about it since then. We learn it and use it, and hopefully don’t forget it. To roll up my sleeves and really pick apart some sentences and paragraphs, and look at how a section could be tweaked and tightened was a great experience. If you are looking for an editor, try the Editorial Freelancers Association. They can help hook you up with qualified professionals. Give your project its best chance of being read. Spend some money on a real editor, not just an English major. I have absolutely nothing against English majors, but their focus is not on the mechanical structure of language and books. You need someone who understands language at that level to help your novel shine. Congratulations on your book! 😀 I hope to become a developmental editor, inshAllah. I’m readying my manuscript to be professionally edited. I like the idea of three editing passes. Excellent advice! Working with a professional is refreshing, both to give authors a new perspective and to show them what it takes to create a polished manuscript. Well done you finding one–it’s a big step!